Previous image, 23 total items. Next image, 23 total items. Expedia has some outstanding Villach travel packages ready for you. Combining your airfares and accommodations is one of the most straightforward ways to save cash on your upcoming trip. Up to 59%* can be saved when you book your package deal on Expedia. Explore our comprehensive database of more than 400 airline partners and 321,000 properties worldwide. Too many to select from? Don't worry — we can help you decide! If you decide to change your mind, we will honour your cancellation request on almost all reservations with no hidden fees. Itinerary looking a little empty? Villach holiday all arranged but no idea what to expect when you arrive? Let us guide you. As you move around soaking up this city's sights and sounds, look out for Lake Faak and Finkenstein Castle. These fantastic sights will without a doubt be one of the highlights of your holiday. Schiller Park is a green oasis of calm amid the frenzy of everyday life. Kick off your shoes and feel the grass beneath your feet or simply lie back and search for shapes in the clouds. Visitors in this destination have an abundance of choice. Public squares have many secrets to tell. Roam over well-trodden footpaths and try to find some clues to the past at Villach Main Square. Still have some time to spare? Roam around exhibits that celebrate and preserve transport history at Villach Automotive Museum. A fabulous record of the evolution of transportation, it features a collection of vehicles and objects of bygone times. Villach offers 15 properties, so pick a comfy place to stay for your next cheap holiday or luxury getaway via Expedia and begin planning all the exciting activities. Try the Wellness und Geniesserhotel Karnerhof (Karnerhofweg 10) and the Hotel Warmbaderhof (Kadischenallee 22-24). These sought-after accommodations don't only come with cosy beds — they come with great reviews as well! If you're flying in, you'll likely be touching down at Joze Pucnik Airport (LJU). After you've grabbed your suitcase from the carousel and wandered outside, the centre of Villach will be just 40 miles (64 km) away. 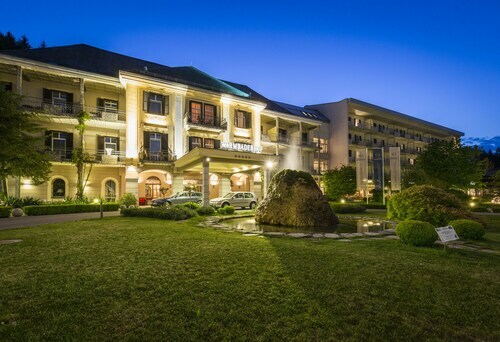 Located near the slopes, this Villach hotel is situated in the city centre, within a 15-minute walk of Villach Main Square and Schiller Park, and is convenient for winter sports, such as cross-country skiing and snowshoeing. Congress Center Villach and Parish Church of St. Jakob are also within 10 minutes. Villach Central Station is only a 2-minute walk and Villach West Station is 18 minutes. This family-friendly Villach hotel is located in the shopping district, steps away from Villach Main Square, Parish Church of St. Jakob and Villach City Museum. 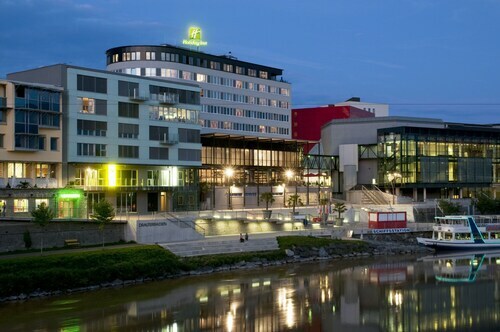 Schiller Park and Congress Center Villach are also within 10 minutes. Villach Central Station is 7 minutes by foot and Villach West Station is 9 minutes. Located in the heart of Villach, this hotel is within a 10-minute walk of Congress Center Villach, Villach Main Square and Parish Church of St. Jakob. Villach City Museum and Schiller Park are also within 15 minutes. Villach Central Station is only a 5-minute walk and Villach West Station is 16 minutes. 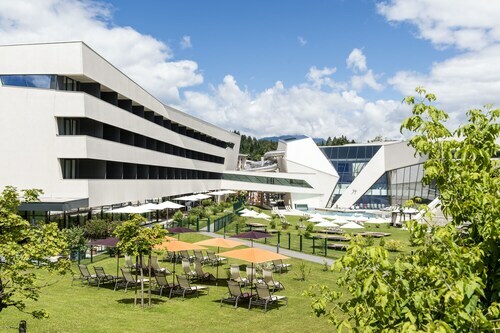 Situated in a regional park, this luxury hotel is within 1 mile (2 km) of Kaernten Therme and Atrio Shopping Center. Villach Alpine Arena and Schiller Park are also within 3 miles (5 km). Warmbad Villach Station is only a 3-minute walk. This family-friendly Villach hotel is located in a rural location, within 1 mi (2 km) of Kaernten Therme and Atrio Shopping Center. Villach Alpine Arena and Villach City Museum are also within 3 miles (5 km). Warmbad Villach Station is only a 2-minute walk. Situated on the waterfront, this hotel is 1.6 mi (2.7 km) from Congress Center Villach and 2.9 mi (4.7 km) from Gerlitzen Ski Resort. Villach Main Square and Parish Church of St. Jakob are also within 3 miles (5 km). Villach Central Station is 29 minutes by foot. Situated in Villach, this pension is 1.1 mi (1.8 km) from Monkey Mountain Landskron and 1.3 mi (2.2 km) from Gerlitzen Ski Resort. Ossiacher Lake and Landskron Castle are also within 1 mile (2 km). St. Ruprecht Bei Villach Station is 29 minutes by foot. 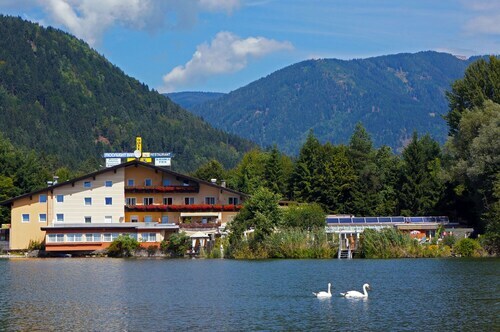 Situated on a lake, this spa hotel is 0.1 mi (0.1 km) from Ossiacher Lake and 1.9 mi (3 km) from Gerlitzen Ski Resort. Monkey Mountain Landskron and Landskron Castle are also within 2 miles (3 km).